When you know how keywords work, you can write better web pages, blogs, and social media posts. 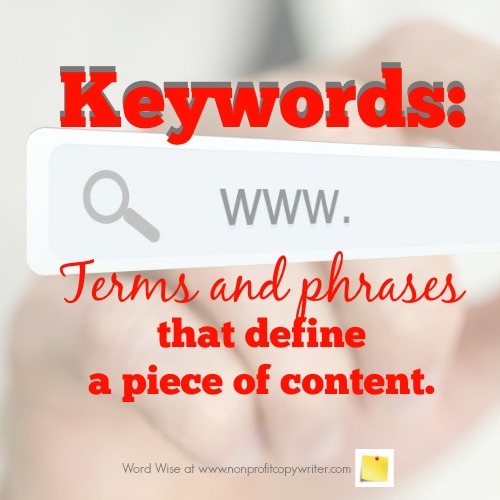 Keywords are terms and phrases that define a piece of content. I found it helpful to understand how keywords work before I set about to choose them for individual pages and weave them into my writing. Keywords help you match the language on your website to the language that readers use when they search for you. It’s not as complicated as it seems because you use keywords naturally in your day-to-day life, although you may not know it. Let’s compare that everyday experience to using keywords when you write. Just as people go to the grocery store to get items they need, they go online to search for information. You help them find that information when you use keywords in your content. A grocery store is different from other stores and businesses because of what it offers: groceries. Your website or blog is different from other websites because of what it offers. You designate that uniqueness with broad keywords to identify your site topic. Before you go to the grocery store, you write down a list of specific items you need like cauliflower, chocolate cake mix, and cat food. When you get to the store you go to specific locations - the produce section, the baking aisle, the pet department – to get the items you need. Likewise, keywords lead the reader to a specific web page or blog post by using specific terms so she can get the information she needs. From our grocery shopping example, you see two kinds of keywords. Long-tail keywords: two- to five-word phrases (hence the “long tail”) that are very topic-specific, like cauliflower, chocolate cake mix, and cat food … or even more specific, such as fresh cauliflower head, Duncan Hines chocolate cake mix, and canned cat food with tuna. These are your heavy lifters as you write individual pages or posts. Their specificity means they have less competition and come up more readily on search engine results, which is useful to you because readers can find you more easily. For you, that means knowing what keywords to use as you write a page or post and then knowing how to place them in your content. Although they are essential for search engine optimization, keywords are not just for online writing. One offline area in which they shine: resumes. Employers and hiring managers scan applicant resumes for keywords that are specific to the position, looking for keywords listed in the job qualifications posting (think “sales skills” or “critical care”) and even action words that demonstrate accomplishment. That’s why it’s important to choose descriptive verbs for your resume.